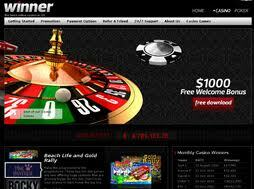 Winner Casino is a gaming site that simply looks great with its colours-on-black background design. Its stylish design is a feature that is hard to ignore, but it's not just flashy surface images that make it one of the best new gaming site around. Let's just have a look beyond that stylish jet-black casino-walled facade to see what really makes it tick. Winner Casino comes with a superb reputation, and that is some achievement given that it's very much the new kid in town - it opened its animated doors in 2009. That reputation is helped by its use of Playtech software, a sign of the highest quality when it comes to realist images bursting with detail and colour. Playtech is also a name associated with fast, effective downloads, and of course with the site’s virtual re-creation of the classic casino look, with its wallpaper designs, sumptuous hues and colour contrasts, the visuals are really brought out very effectively on the website. It is also brought to you in a variety of languages other than English, such as German, Spanish and Dutch but eleven in total. As far as games variety goes, the site offers over 300 you can choose from. These range from the popular casino games such as video poker, blackjack and roulette, through to new games like Top Trumps Football Stars and Marvel slots, a game inspired by the Marvel superhero comic books. Slots variety is endless, and includes the popular progressive jackpots. All games are, of course, augmented by Playtech's visual flair and speedy downloads. There's also Winner TV, which brings the real-life casino a step closer to your computer screen, with its fabulous detail and television celebrities playing the live dealers. All games come both in a Flash or a download version and with play money or real money options. There are literally dozens of different payment methods available, from the seriously well-known ones such as Visa, Diners, Maestro, Click2Pay and Moneybookers, through to a whole host of other banking choices, all available in sterling, dollars or Euros. Speed of payments can vary, depending on which method is used. Many of these banking options come with 10 or 15% bonus on them. It is advisable to check the payment options page on the site for details. And while we're talking of bonuses, Winner Casino offers up to $1000 welcome bonus. You can get a 100% up to $300 on your first deposit, 150% up to $300 on your second and another 100% up to $100 on your next 4 deposits. There is also a loyalty bonus scheme to reward those gamers who stick with the site and even a $50 refer-a-friend bonus to be had too, and those newly joined up gamers even get a $25 bonus for joining. How's that for a friendly welcoming handshake? And for every bet made you can accumulate complimentary points (or 'comps' for short) which can then be converted into real money. In doing this you can also up your VIP level, giving you the opportunity for even potentially bigger prizes. Customer support is excellent, with 24 hours a day, seven days a week availability should the need arise. There's also help on the website with things like start-up queries and a FAQ section. You can also email if you have any problems.